Amethyst gemstones are vibrant and beautiful, which is why it is no surprise that many jewellers utilise the stunning appearance that naturally emanates in amethysts within the construction of their jewellery. At Kennedy Jewellers, we are lovers of the amethyst gemstone, and incorporate many different amethysts into our designer jewellery so you can adore and adorn them, too. Amethysts are appealing to most as they are clear, brilliant and their appearance alters – meaning you could adorn yourself in amethysts and be continually surprised and delighted as their colours dance under different modes of light. When looking at an amethyst, it is important to look for a balance of strong, deep purples whilst still retaining a hint of transparency – these amethysts are considered the most beautiful and the most valuable. Amethysts come in a wide variety of sizes, cuts and styles, choice in the end comes down to personal taste, finding the right stone that “sings” to you, a task we are ready and willing to assist you with. At Kennedy Jewellers in Coffs Harbour we are scrupulous about the gemstones we incorporate into our unique, one-of-a-kind jewellery and find it a pleasure explaining the nuances of our vast and unique fine gem collection. 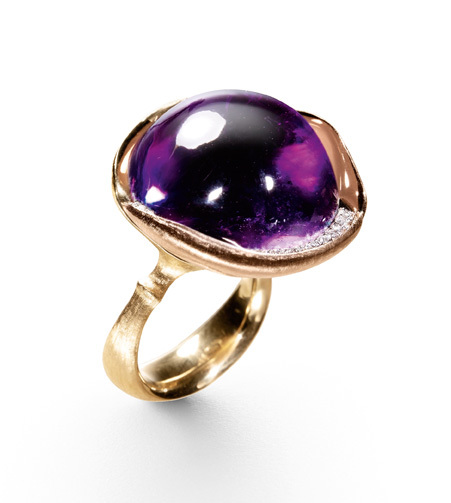 Amethyst was once used as a favoured jewellery gemstone by the ancient Egyptians, who are looked to even today for inspiration for modern jewellery designs. This makes amethyst the perfect gift for your loved one, with positive associations such as healing, positivity, balance and love. What better way to show you care than by giving beautiful amethyst birthstone jewellery this month? 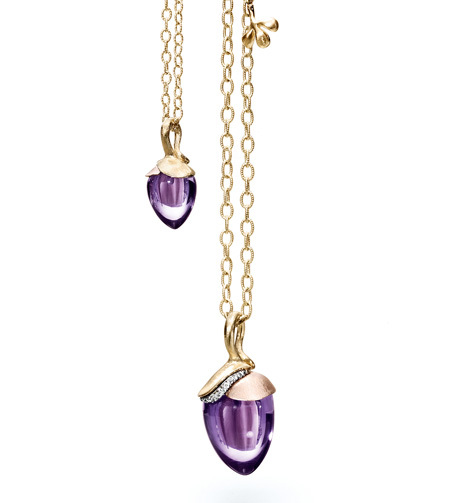 Truly showcase your love and let it blossom this month with the gorgeous Lotus Pendant by Ole Lynggaard Copenhagen available at Kennedy Jewellers – a piece that incorporates beautiful Amethyst gemstones combined with 18ct yellow and rose gold with a hint of diamonds for a subtle trace of brilliance. Look into the heart of this gorgeous amethyst ring and see yourself – at peace and in harmony with you and everything around you. This is the gentle and soothing ambience created only by the Lotus Ring – with its gorgeous amethyst inset in 18ct yellow and rose gold with a sprinkle of diamonds, this ring is sure to impress and inspire this month and always. At Kennedy Jewellers, we are dedicated to designing and crafting beautiful designer jewellery made to last a lifetime. Our Master Jeweller expertly hand-crafts exquisite jewellery designed to be loved and adored by clients all over the world. If you are after the perfect gift this month, be sure to choose amethyst – the signature birthstone for all born in the month of February. So give the perfect gift this month with our amazing and unique amethyst jewellery available only at our Coffs Harbour showroom. If you are after amethyst jewellery and have a specific design in mind, contact us at our showroom to book a full design consultation, where we will sit with you to discuss your needs and help you design the perfect bespoke jewellery. At Kennedy Jewellers you will always find sophistication, elegance, beauty and uniqueness – the perfect blend for beautiful jewellery that not only looks beautiful, but tells its own story. To discover more about amethysts, or to book a design consultation at our Coffs Harbour showroom, please do not hesitate to contact us.